(Bloomberg) -- If Donald Trump’s administration was looking for signs of easing tensions between two of his vaunted constituencies -- blue-collar oil and rural farmers -- a hearing in Michigan proves otherwise. The two sides exchanged heated comments Friday at a public hearing over proposed changes by the Environmental Protection Agency on ethanol policy. Oil refiners and agricultural proponents, including Iowa Governor Kim Reynolds, a Republican, made pitches on how their groups stand to benefit -- or be harmed -- by the administration’s vow to allow higher sales of ethanol and planned reform for trading of biofuel credits. The hearing in Ypsilanti, Michigan, came just a day after Trump held a rally in the state in Grand Rapids and underscored the tightrope the president will have to walk to appease both sides. 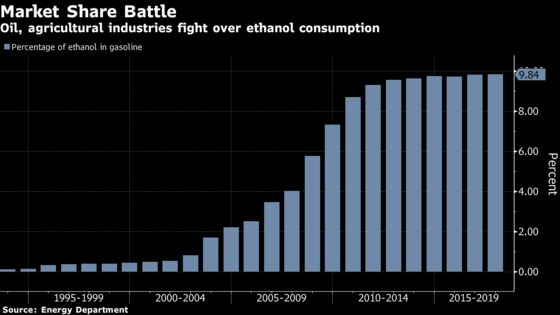 Ethanol in the U.S. is made mostly from corn, and expanding sales could help lift grain demand at a time when farmers are suffering from the U.S.-China trade war. At the same time, it would cut into gasoline demand. Meanwhile, a segment of the oil-refining industry has long advocated for changes to associated credits that show compliance with the biofuel blending mandate. Last fall in Iowa, the largest corn-growing and ethanol producing state, Trump promised to unleash higher sales of the biofuel. The move followed a series of White House meetings with oil-industry advocates and agricultural proponents that fell short of reaching a deal. The administration has targeted having the shift in place by the U.S. summer driving season. “President Trump made a commitment to Iowa last October, and Iowans expect it to be kept,” Reynolds said. The commitment the governor cited was Trump’s pledge to allow for year-round sales of so-called E15, a blend of gasoline comprised of 15 percent ethanol. That ratio currently is restricted on fuel in some areas during the summer months. The EPA’s proposal on E15 “is an anti-consumer policy that goes beyond EPA’s statutory authority and should be withdrawn,” said Frank Macchiarola, vice president downstream and industry operations at the American Petroleum Institute in Washington, said. The reforms to the RIN market are a “solution in search of a problem,” he said. “This proposal is the result of the president’s desire for a ‘win-win’ deal on” biofuel policy, Macchiarola said. Meanwhile, the agriculture side also used the hearing as an opportunity to express concern over the administration’s distribution of so-called small refinery exemptions, the waivers that the EPA grants if a company shows that its obligations under the biofuel mandate threaten economic harm. As of Thursday, the EPA has exempted 35 refineries from 2017 biofuel blending quotas, and the agency is still considering 39 for 2018. Oil refiners argue that the administration is following the law in issuing them. Geoff Cooper, president of the Renewable Fuels Association said that the small refinery waivers risk making the E15 rule a zero-sum effort, because it reduces the incentive for retailers to adopt the higher blend. He urged the agency to “exercise more restraint” as it considers the pending waivers for 2018. The waivers are “moving the Renewable Fuel Standard backwards instead of forwards, which is not at all what the president campaigned about when he was seeking office,” Emily Skor, chief executive officer of trade group Growth Energy, said in an interview following testimony. Even bikers, another constituency Trump has courted, weighed in at the hearing. Prior to testifying, Tom “Jinx” Rahn, a Michigan representative for the Motorcycle Riders Foundation, said he wanted the EPA to be sure that the new policy would force retailers to separate E15 pumps from others, so he doesn’t accidentally fuel his Harley with the higher blend.